A year after moving into its new space in South Pomfret, ArtisTree Community Art Center & Gallery has mounted "Unbound Vol. V," its most ambitious show to date. The annual exhibit "for art lovers and bibliophiles" is held in conjunction with Bookstock, an annual three-day event in Woodstock that celebrates writers and poets of northern New England. Every year — this is the fifth — the Friday-night opening reception for "Unbound" is also Bookstock's kickoff party. As the culminating show in a year's worth of exhibitions in the new gallery, last Friday's celebration was especially apropos. "Unbound" is a juried show open to regional artists who want to explore the book as concept, object and format. Participants are encouraged to free both themselves and viewers from common preconceptions about book-inspired work. The 55 pieces in this year's exhibition present sculptural, pictorial and tactile explorations of the concept. 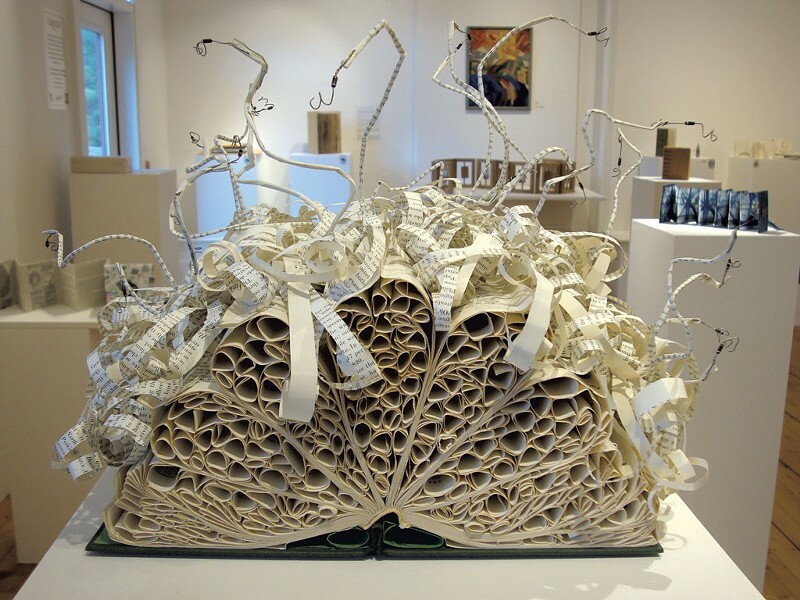 Beautiful, playful and enigmatic, the "books" are filled with all manner of secrets. Gallery director Adrian Tans has likened the exhibition to a cabinet of curiosities. This year's juror was artist Peter Madden, who teaches book arts and alternative photography at Boston's School of the Museum of Fine Arts and Massachusetts College of Art and Design. His work has been exhibited around the country. The 1,100-square-foot ArtisTree Gallery is somewhat larger than the gallery's previous quarters in Woodstock, and its three-room configuration allows for more exhibition space. This is fortunate, as many of the pieces are freestanding. On view are accordion books, handmade books with hand stitching, sculptures created from actual old books, and others made of ceramic, metal or cast iron. The works sit on pedestals, tables or the floor, or are mounted on the walls. This kind of exhibit merits a slow wander for close viewing, and a second or third look. Ania Gilmore and Annie Zeybekoglu's "&" is a paper accordion of letters spelling their way into a sentence, which stretches across an end wall. Without an attentive look at the monochromatic red cutout, the viewer would miss the message. Nearby, "The Lonely House" (monoprint; paper, pen, ink, book board, cloth) by Katie Higgins-White delivers a combination of words and images across 12 accordion book-board panels. Three-dimensional images pop from the folds between panels: a pair of double doors appears in one, a house perched on a hill in another. Created in various shades of black and gray, that house looks as lonely as the work's title suggests. By contrast, Marcia Vogler's mixed-media work "Diffusion" takes a more painterly approach. Colorful shapes march across its folded "pages," creating miniature abstract paintings within a sculptural framework. A rectangular container stands by to hold the work when it is folded. In another room, Vogler's "Phancy" is a controlled explosion of paper and book, gloriously breaking out of the confines of its neatly laid-out pages. Sarah Smith's diminutive folded-paper book "Posers International" uses appropriated photographs of (mostly) men receiving trophies or appearing with their trophy wives or children. Smith provides a short narrative for each image, as if she were familiar with the parties depicted. For instance, "Maintaining the most fervid smile possible, Bob Brackett presented Stanley Tallhead with the trophy for the Most Effective Sidelong Glance During a Commotion." "Posers" is funny and absurd, and its alternate universe is eerily familiar — as strange as the one we inhabit. This is one of many pieces in the show that visitors are allowed to handle, and gloves are available for doing so. Jeffrey Simpson offers a weightier work with his hefty tome "History of Modern Art." About 24 inches high and weighing 75 pounds, the voluminous faux book made of cast iron provides a counterpoint to the airy, sculpted paper works throughout the exhibit. Its mass could be an homage to art history or an ironic reaction to that history's influence on contemporary art. Norwich artist Kathy Cadow Parsonnet introduces a lighter touch. Two of her "Movable Art" books consist of hand-painted, magnetized shapes, which can be arranged and rearranged on magnetic pages to create narrative and abstract images. A third book, "Clean Thoughts," made of waterproof paper and Tyvek, can be written on with a marker in the shower. Judith Taylor has two compelling entries. "Volume I: Out of the Box" features a Rapunzel-like tangle of long, curled strands of brown paper covered with words and phrases; these dangle from a height of about four feet, perhaps from a hidden pedestal. Suggesting the flow of a fountain, the strands pile up on the floor. More powerful and subtle in its execution is Taylor's "Only the Hand That Erases Can Write the Real Thing." The artist filled this handmade book with writing, and then meticulously erased every word. The remnants of erasure — the lost words — survive as tiny scraps of paper and even smaller bits of eraser, tinged with pencil and stored in a small jar that is tethered to the book. Taylor seems to suggest that the eraser is a powerful tool for unleashing one's thoughts. 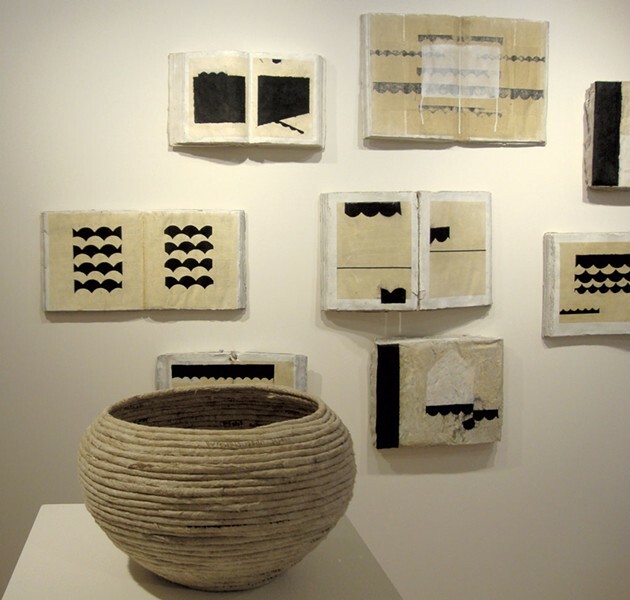 First prize in "Unbound" was awarded to Benjamin S. Cariens for "Written," which consists of 11 wall-mounted "books" made of Hydrocal plaster, paper, ink and paint. Their strong graphic quality, with the India ink predominating against a neutral palette, is riveting. Though strong individually, the pieces read together like a musical score. The second-place award went to Vivien Masters for her oil-painted portrait of "Tamora, Queen of Goths" on a well-worn red-leather edition of a Shakespeare trilogy. Simpson earned a third-place win for his "History of Modern Art." Honorable mentions went to Taylor for "Only the Hand That Erases Can Write the Real Thing," to Higgins-White for "The Lonely House" and to Hali Issente for "Kaleidoscope." The last is a colorful collage pieced together from old book cloth and waxed string, framed and mounted as a painting or document. Five years in, "Unbound" has turned a page and is bigger and better than ever. With physical books and the publishing world threatened, it's encouraging to see that the community, artists and audiences support book making — even if these volumes aren't real. The original print version of this article was headlined "Good Read"